Made of aluminum alloy material, small density, good thermal conductivity, good corrosion resistance and high strength. 4-digit combination lock to guarantee security. Allows access to the selected few. Store up to 5 keys for home, car or padlock. Easy and convenient to adapt to the items supplied. Ideal to store keys safely. DURABLE & SOLID CONSTRUCTION: Made of high quality rustproof zinc alloy and heavy-duty steel, which is sturdy, non-corrosive and weather-resistant. Difficult to break into it, hidden, safe and discreet, great for outdoor usage. 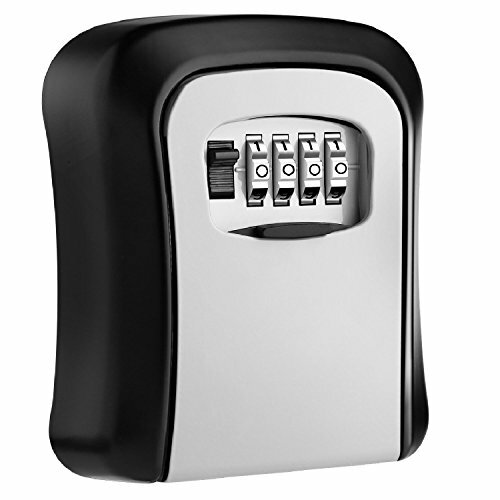 LARGE SECURE SPACE TO STORE: With large interior space, holds up to 5 keys. You can store the house keys, office keys or other keys inside securely when you are at work or on vacation. With a sliding shutter cover to protect the combination dials from bad weather, wear-resistant. STYLISH & POLISHED DESIGN: The key lock box is painted with environmental protection paint, hardly lose the color. The four corners with outward arc design make it beautiful and fashionable. Wall-mounted construction provides a fixed and safe location to store & hide keys.